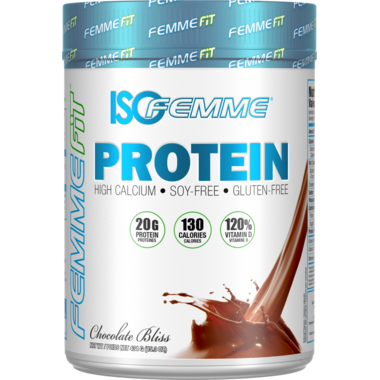 ISOFEMME is the Ultimate Protein Smoothie Designed Exclusively for Women! Imagine a smooth, creamy and deliciously thick milkshake. Does this instantly make you cringe at how many calories and fat you’d also be consuming? Well, if you’re enjoying a sinfully delicious ISOFEMME Protein Smoothie, you can give in to your sweet cravings and enjoy a delicious high protein smoothie, while watching your caloric intake as each serving contains only 120 calories. This breakthrough protein smoothie created exclusively for women includes a proprietary protein complex that yields very high levels (17.5%) of a specific fraction of protein called Glycomacropeptides. These naturally help curb the appetite and provide an ideal option for those women following a weight management plan. The ingredients in ISOFEMME can help tighten, tone and shape the curves of your body, by increasing protein absorption and delivery. 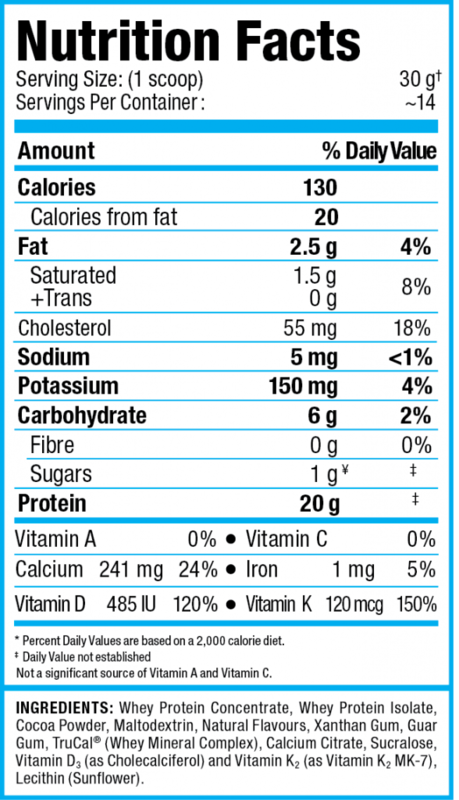 ALLERGEN INFORMATION: Contains Protein derived from Milk and Lecithin derived from Soy (less than 1%). Produced in a facility that also handles egg, peanut, tree nut, fish and Crustaceans/Shellfish products. SUGGESTED USE: Mix or shake 1 scoop (31 g) with 4 - 6 oz of cold water or skim milk. I love this protein powder. It takes amazing and it has the perfect amount of sweetness. No aftertaste. I love both flavours. I liked the taste and it didn't have a bad sweetener aftertaste. On the other hand, my husband thought it was the worst tasting shake he's had. More for me :-). It tastes almost good, but I'm a kind of person who doesn't put sugar in the coffee at all and cut half the amount from every recipe. This product in my opinion is good but way too lot sugary than what it should be. This protein powder tastes amazing! Definitely would recommend it! Very smooth, though a tad too sweet and if you add more water it tastes off. Definitely still better than most products out there. This is amazing, it's the first protein powder I actually look forward to drinking! I only wish that it came in bigger sizes. This is a repeat purchase. It's the best-tasting protein powder I've come across, and the nutrition is great. I mix mine with 1 cup of skim milk.